By Kendra Langlie, a freelance writer, communications consultant and lover of arts and culture, lives in Tampa. Comments? Contact 83 Degrees. Article photos by Julie Branaman. Published November 11, 2015. 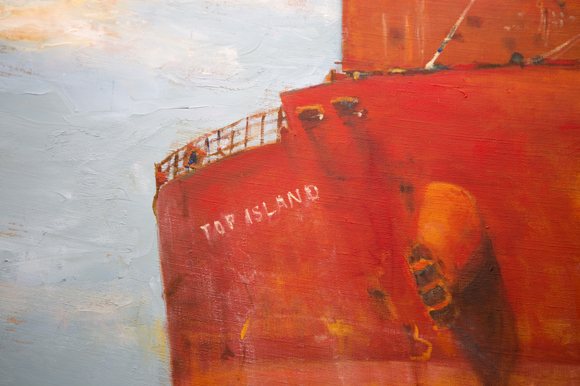 Artist Laura Waller’s new series of 25 paintings puts the spotlight on the gritty grandeur and bustle of Tampa’s most important international commerce hub — Port Tampa Bay. The series will be available for viewing at the Clayton Galleries in South Tampa beginning January 23 through March 7, 2015. Waller’s work — in water-based oils for this series — provides a warmth and an impressionistic feel in how she treats light, though any softness of more often painted subjects, say, haystacks or water lilies, is entirely absent. Imposing, formidable ships with all their rugged, angled accoutrements – heavy, steel, potentially lethal (should they snap) mooring ropes, forklifts, tugboats and a ubiquity of rust — instead lend the viewer the true brute perspective of human-to-craft scale at the Port. To behold raw industry through the eyes of an artist like Waller brings a level of beauty, color and interest rarely bestowed upon such a subject. In fact, the existence of this particular subject, Florida’s biggest Port, is all but ignored by most, save for the occasional cheer surrounding the comings and goings of cruise ships. In reality, the gravitas of Port Tampa Bay and its impact on the state’s economy cannot be underestimated. The local Port in the heart of downtown Tampa represents $15.1 billion in economic activity and provides directly or indirectly 80,000 above-average-salaried jobs, according to Edward Miyagishima, Port Tampa Bay Senior Advisor in citing a 2013 economic impact study. It is currently the largest and deepest port in Florida – with 5,000 acres and a depth of 43 feet, though Miami and Jacksonville have plans to deepen their ports soon. Put in context, Tampa’s Port is about 10 times the size of Miami’s in terms of acreage. It is also the largest in Florida in terms of tonnage shipped of phosphates and petroleum. 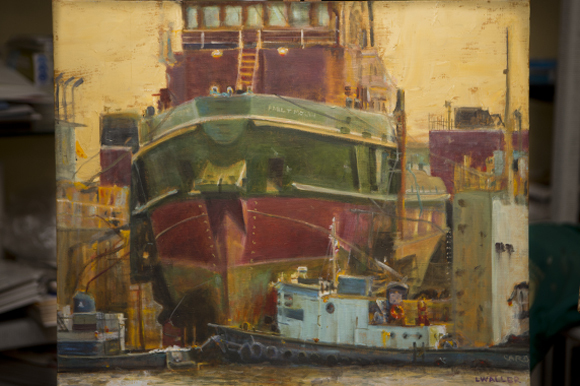 Waller’s Port paintings are an expansion of her 2009-2013 East Coast-West Coast series in which she became intrigued with the everyday environment of the working waterfront. On the East Coast, she discovered, “you interface with the water close-in,” and decided it was time to explore more closely her own backyard. She wanted to experience the Port first hand. This is easier said than done. As Miyagishima says, “Ports are mysterious. Everyone walks through the airport, you don’t get that opportunity at the port.” Homeland Security and safety regulations keep access tight; the Port is generally closed to the public. 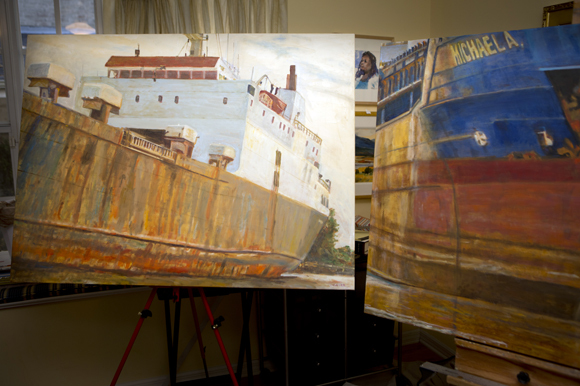 Even the maritime vocabulary and equipment requires a learning curve, which Waller describes as “almost like calligraphy.” She says she would like to go back and have the opportunity to accompany a harbor pilot – the specialist who boards and guides the barges and ships safely to dock – and also to photograph the port at night. Waller’s route to professional artist has been an interesting journey in its own right. Founder and CEO of Waller & Wax Advisors, Waller was a successful certified financial planner based in Tampa for more than 30 years. For nearly as long, she has found refuge in another port town of a different flavor: Rockland, ME. “It’s the only way I could get away from the stock market!” she says. While her left-brain was wrapped up in her day job, she continuously nurtured her artistic side studying and painting watercolors, particularly during the time she spent in Maine. 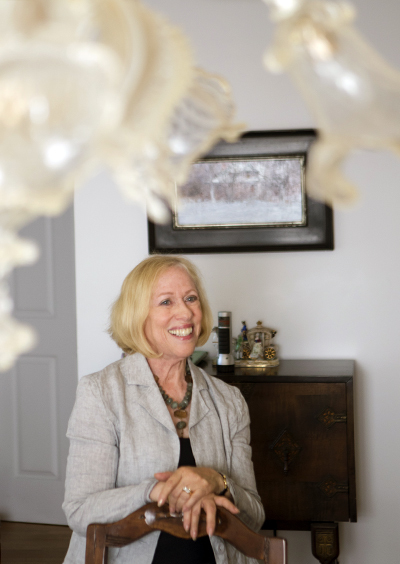 While Waller was more than accustomed to helping others plan their transitions into retirement, her own transition was marked by a diagnosis of breast cancer in 2005 and her treatment at the Mayo Clinic in Minnesota. There, she was encouraged to participate in the biennial Eli Lilly Oncology on Canvas Program, entering a watercolor painting that was included along with the passage she wrote about it, in the exhibition that traveled to the Royal Academy of Art in London and worldwide. Since making that transition in 2011, she has also changed her media of choice to water-based oil and studied closely with artist Tina Ingraham to perfect technique. Waller has since won numerous awards, has exhibited at galleries and shows throughout Florida, Maine and Oregon, and has received three fellowships to the prestigious Vermont Studio Center Residency in Arts Program (the third will be in 2015). Clayton says there is already tremendous interest in the project from the Port and the City of Tampa and anticipates more so when the series is displayed in its entirety. A piece from the series is already on exhibit at the Fine Art Exhibition at the Tampa Bay Lightning Amalie Arena, and another has been requested from a museum in Oregon.